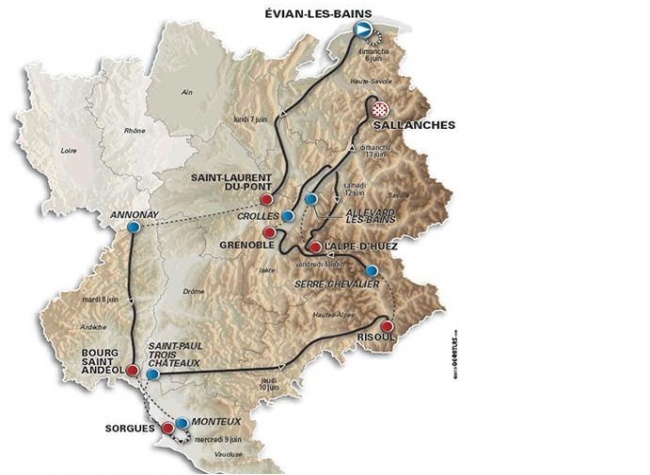 The Giro is a few days from wrapping up, so cycling fanatics will be looking towards France pretty soon. No, not the Tour de France (yet! ), but an 8 stage ‘warm up’ in (and near) the Alps in the southeast of the country. The Dauphiné Libéré has been run since just after WWII, and has plenty of climbs, making it a good testing ground for riders’ legs before the Tour begins a couple weeks later. It is unconfirmed right now, but Lance Armstrong has mentioned that he might be racing this year.